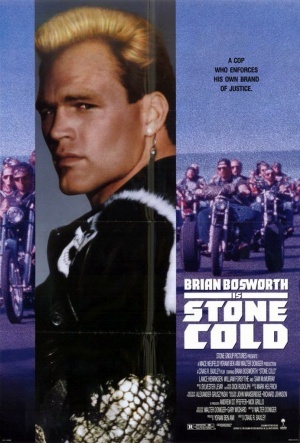 Stone Cold is a 1991 action movie about a biker gang, The Brotherhood, who are going after legal officials. The brazen murder of a judge, sends the FBI into action. And that sent us into action. We love our action flicks, we love fights, we love explosions. 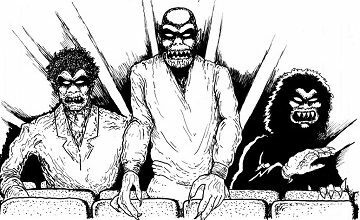 The Really Awful Movies Podcast is all about that! Brian Bosworth is Joe Huff (a great action movie name if there ever was one), a tough Southern cop, on suspension for beating the snot out of dirtniks in a convenience store. He’s summoned by a wimpy agent, who along with colleagues, blackmail Huff into taking part in a dangerous mission: becoming a member of The Brotherhood, in order to infiltrate the gang. The gang’s got deep ties to the mafia, and is led by the charismatic Chains (Lance Henriksen). Meanwhile, Huff adopts a new ID: John Stone. Will he be able to go from prospect to biker, and take down the outlaws? Or will his terrible fashion sense get in the way? CHECK OUT, STONE COLD.